For our customers in the space launch industry the requirement to perform pyrotechnic shock testing in the course of qualifying major subsystems and critical components of a space craft or payload is often a daunting prospect. This is due to the uncertainty associated with achieving specified shock levels (expressed in terms of an acceleration based shock response spectrum, or SRS) in traditional ordnance induced tests. 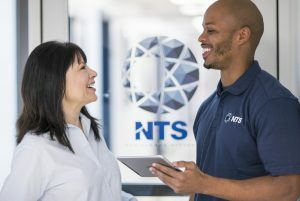 Historically, NTS and its competitors have performed iterative “equalization” tests using mass models of the product to be tested, or non-functional parts, to arrive at a test design that is acceptable to both the testing facility and the customer prior to running the shock test on the hardware to be qualified. This can involve significant expenditure of both test scheduling resources and consumption of test fixture hardware until a test design is agreed upon. 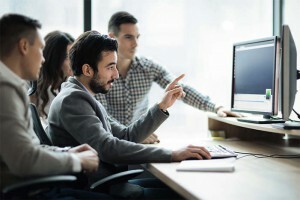 There is also the resulting problem of significant over-testing across wide frequency ranges to insure the chances of an under-test are minimized. Ordnance induced pyrotechnic shock testing is performed using a small explosive charge to impart an intense and very short (microseconds in duration) impulse to a resonating plate. The resonating plate responds to this impulsive load by propagating elastic stress waves (while some localized plastic deformation on the plate beneath the explosive charge does occur) throughout its volume which then reflects off free surfaces creating a very complex three dimensional transient stress field. It is this complex transient stress field that imparts the shock acceleration time history to the shelf or other test fixture structure acting as the interface between the resonating plate and the unit being tested as shown in Figure 1 below. For the last couple of years, the engineering services group at NTS Dana Point, CA, in partnership with our test facilities that perform pyrotechnic shock testing, has employed an explicit finite element solver, LS-DYNA, to perform design and analysis of pyrotechnic shock testing for various customers. This approach allows NTS to evaluate a wide range of pyrotechnic shock test fixture design options, explosive charge quantity and placement, in combination with basic mass properties models of the customer’s test article, without consuming any hardware resources. Recently, this unique capability was recognized by the selection of the NTS paper, “Modeling of Ordnance-Induced Pyrotechnic Shock Testing,” for the Henry Pusey Award (best paper) at the 84th Shock & Vibration Symposium in Atlanta, GA in 2013. 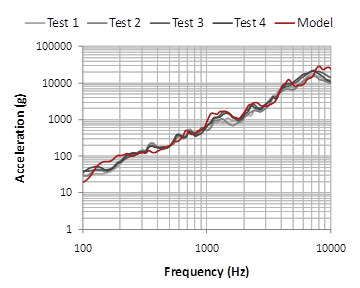 As shown in Figure 2 below, excellent agreement has been achieved between the modeling and simulation results. Although the commercially available explicit finite element solver, LS-DYNA, is a great resource for performing the required analyses, the key enabler of this capability has been the rapid evolution in computing power at the PC desktop workstation level. For the modeling approach to serve in the role as a functional replacement for performance of iterative equalization testing to evaluate a variety of test fixture design concepts and explosive charge size and placement, the turn-around time for performing each test fixture design iteration using the explicit finite element based modeling approach must be on the scale of 30 minutes or less of wall clock time. Run times on this scale for these models are now routinely achieved at our facility in Dana Point, CA. This approach also allows for a considerably wider range of test fixture design concepts to be evaluated without any risk to the customer furnished test hardware, as the additional cost and schedule associated with fabricating and assembling each test fixture design iteration is absent. Explicit finite element modeling techniques have traditionally served in the role of weapons design codes for the US DOD and DOE. It is now being recognized that these same techniques have wider application to non-defense industries ranging from automotive and aircraft crash test analysis to safety barrier design and aerospace pyrotechnic shock testing design may now be added to this list. NTS Dana Point specializes in engineering services to a range of industries in the defense and commercial sectors. More information can be found on the NTS Dana Point webpage, or by calling 949.429.8602.